Cheetahs have always been a special species to me. Since I was a little boy, I have been fascinated by them for many reasons (of which their immense speed was obviously one). As I took up photography, I came to appreciate more of their nuances. But one thing that's pretty challenging when photographing them, is getting their amber eyes to come out nicely - this can only really happen in that first and last light of day when the sun is flat enough to shine in under their slightly protruding brows. During the rest of the day these same brows/eye-banks cast their eyes in shadow. This image was captured early one morning at the Craig Lockhart waterhole in the Kgalagadi Transfrontier Park. I sure hope to be seeing cheetahs on our upcoming family trip there! 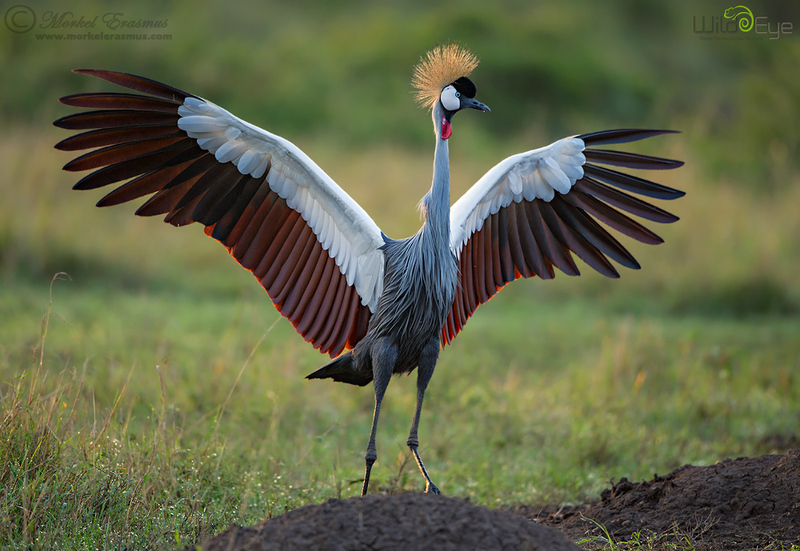 During the recent Wild Eye photographic safari that I led to the Mara Triangle in Kenya, we had some very nice sightings of (in my mind) Africa's most beautiful crane species - the Southern Crowned Crane (or Mahem Crane). This photo was taken as the early morning light burst through the clouds on the horizon and lit up the outline of this crane as it was performing a mating dance. Ready to roll with this week - bring it on! I've seen many specimens of the famed Nile Crocodile in my life on various trips to various reserves and national parks. 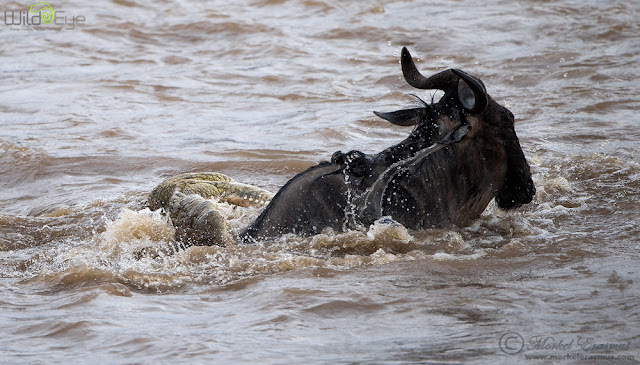 I've yet to encounter crocodiles as big as the ones I saw last month in the Mara river in Kenya. During the river crossings these massive Mara monsters have a field day among the wildebeest and zebra that cross the Mara and Talek rivers. This photo was captured during a relatively small crossing at a relatively "easy" crossing point in the Mara Triangle. It was quite an adrenaline rush watching the crocs hunt, and anticipating where they will strike next. Many a young animal was cheered on and applauded when it reached the other side without falling victim to these brutes. So that's another epic Mara moment shared! I've got many more photos to work through and not half the time that I need for that mammoth job - so please be patient. 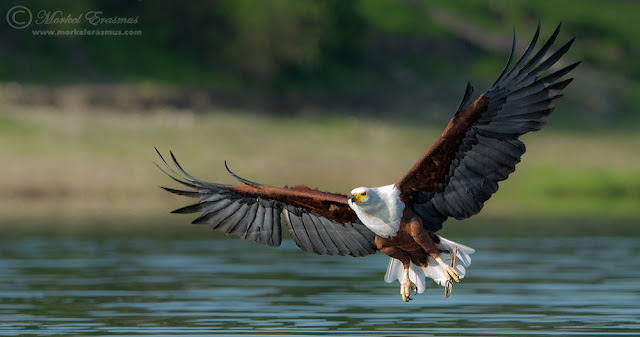 There are few birds in Africa that evoke more in us than the African Fish Eagle. It has been my favourite raptor for years, and their haunting calls along Africa's waterways are an amazing reminder of the privilege we have to be on safari. One of the best places to see and photograph them is on the Chobe river in Botswana. You can join us on a Wild Eye safari to this amazing oasis of wildlife where we will use a specialised photographic boat fitted with rotating chairs and mounted gimbal heads for your long lens, while based on a luxurious houseboat that can moor deep into the Chobe National Park for special access to key parts of the river in good light when other operators need to move out to make the "gate times". There's one date left in 2013 but 2014 dates are already laid out - I will be leading a trip from 12-16 March 2014. You can book and see all the details and info (plus images of the boat and houseboat) HERE. This image was taken from the Wild Eye photographic boat. I just love how the light reflected off the water displays on the bird's open wings. Hello there! It's Monday - so why don't we just gallop into the week ahead full force, even if we might look a bit ungainly after the weekend's activities? 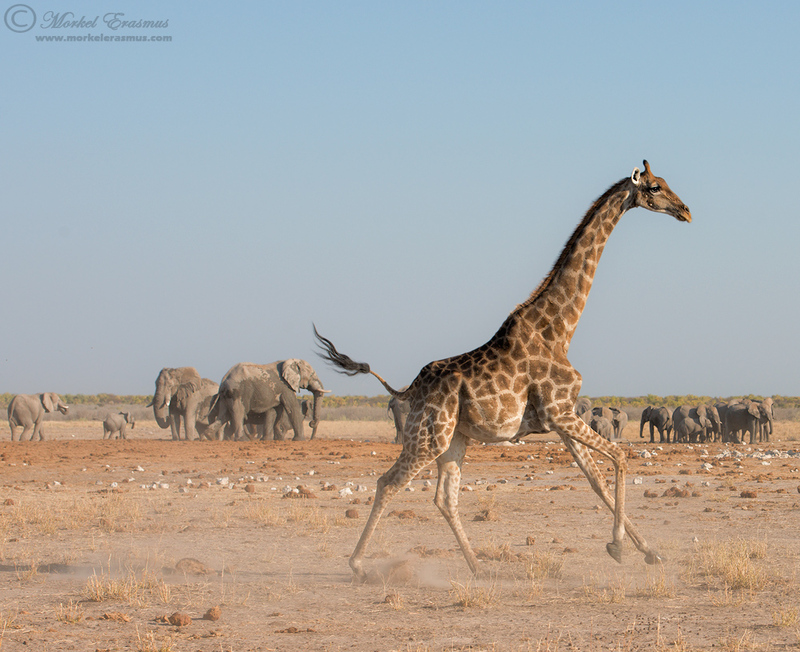 This lone giraffe was running past a herd of elephants at a remote waterhole in Etosha late one afternoon. In about 5 weeks I will be heading back there with my family - can't wait! I love using other animals in the background to add context to a scene. Wildlife behaviour is a treat to observe and photograph. Yes, there are many many mundane moments where you just have to sit and wait it out. Take sleeping lions, for example...boring...until they suddenly get up and stalk something that ambles by. If you really want to capture some interesting - almost anthropomorphic behaviour - you need to pay attention to the smaller critters of the bush. The primates and the squirrels are good examples. Until next time...keep - uhm - grooming! 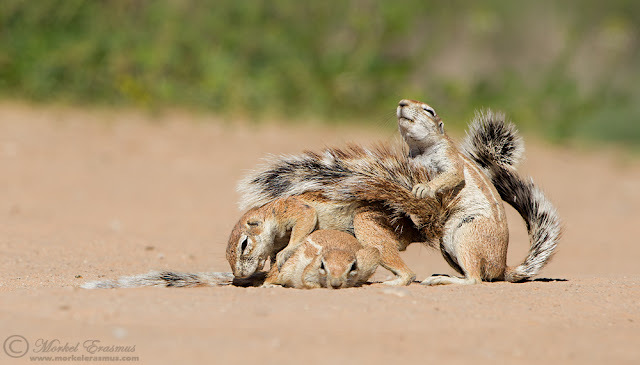 Southern Africa has a couple of interesting canids to see when you are on safari. 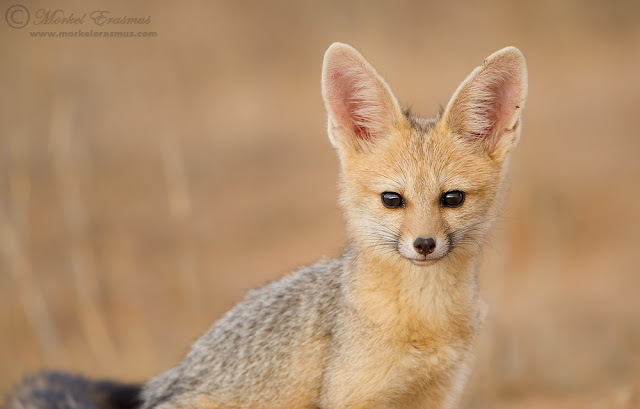 Besides plenty of Black-backed Jackals, the rare Side-striped Jackal and the funky-looking Bat-Eared Fox...there's also the Cape Fox (Vulpes Chama). This is our only true fox species, and they are beautiful and great fun to photograph. Later this year I will be headed back to one of my favourite parks with my family - the Kgalagadi Transfrontier Park in the Kalahari desert. We will be going right in time to hopefully see many dens of Cape Foxes with the young ones playing about energetically. This particular kit was sitting in a slight drizzle right outside its den, and also right beside the road. I used my telephoto lens and went in for a tight portrait. I hope you enjoyed this one. Have a great week, friends! 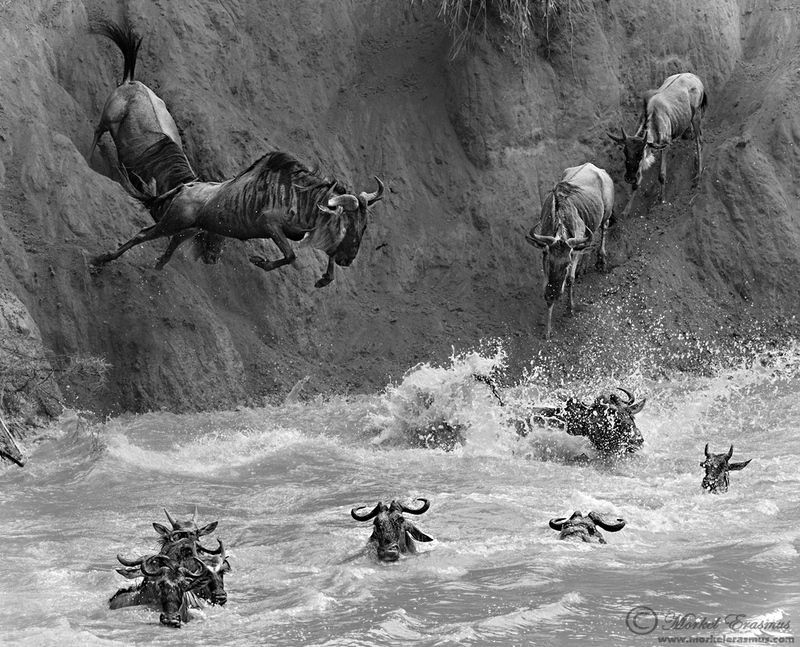 I suppose at some point it had to come...the obligatory photo of a wildebeest crossing, stock standard from every person who makes the pilgrimage to see this spectacle. I thought a lot about how to approach these scenes (from the comfort of my office chair) before the trip, but let me tell you - when the moment arrives, you just bore down to base photographic instinct and shoot. There's very little time to really think your composition through, very little time to compensate via settings for a specific mood and feel, and very little time for much more than just looking for an opportunity in this chaos to make an interesting image. I hope this image is one you find interesting. This particular crossing had some precarious ledges and drops that the wildebeest had to negotiate. My guests and I played around with various shutter speed settings throughout the sighting to ensure good variety and a difference in how the chaos was portrayed. In this one I was using a faster shutter speed. Overcast conditions helped to tame the strong contrast and harsh shadows you normally see in these scenes. If you would like to join us in the Mara Triangle with Wild Eye next year, you can add your name to the waiting list for the dates that go live on 1 November 2013. If you've ever tried to photograph a cheetah hunt, then you would know that it's over in a flash, and you often just can't track the movement changes of the chase well enough. 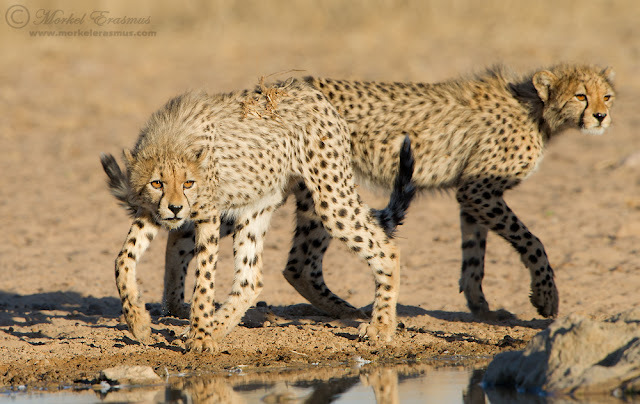 During our recent Wild Eye Great Migration Photographic Safari in the Mara Triangle (Kenya), we pulled into a cheetah sighting just as the hunt was about to begin. I quickly told the guests with me which settings to dial into their cameras, as I know from past experience that shutter speed and aperture need to be protected in these cases, and ISO should be the one to sacrifice. This photo is one of the sequence I captured last week. It's not perfect - why? Is it the light? The light is a bit harsh, mid morning actually - but it was slightly overcast so I think it came out nicely, so no. It's the framing, right? Because the gazelle's one horn is "clipped" on the right of the frame. It's full frame on that end, I actually ended up cropping a wee bit from the left and bottom to frame the overall action better. I think it does. Besides my obvious emotional connection to an action image like this which really portrays a split second in a frenetic life-and-death tussle...I think the horn is less of an issue than the cheetah's tail, which is what I often end up "amputating" by poor framing. 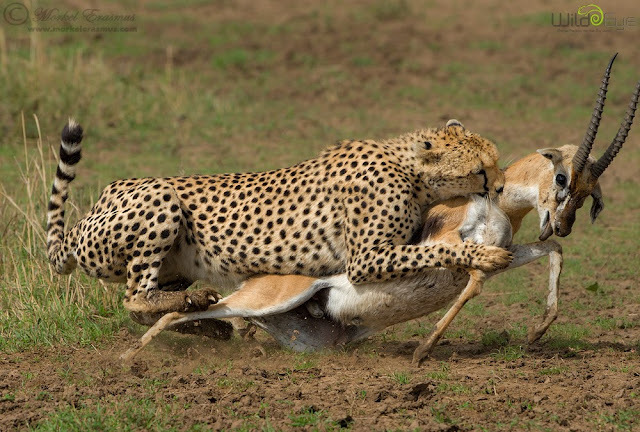 In this case, the cheetah's grace and power in the final take-down of the gazelle is the focus (not to take anything away from the "oh crap" expression on the prey's face)...so the horn becomes less of an issue. What do you think? Would you ever delete a photo like this from your library because of the flaw I listed above? Drop me a comment below and share your thoughts!